- Snakes as pets; Fiction. 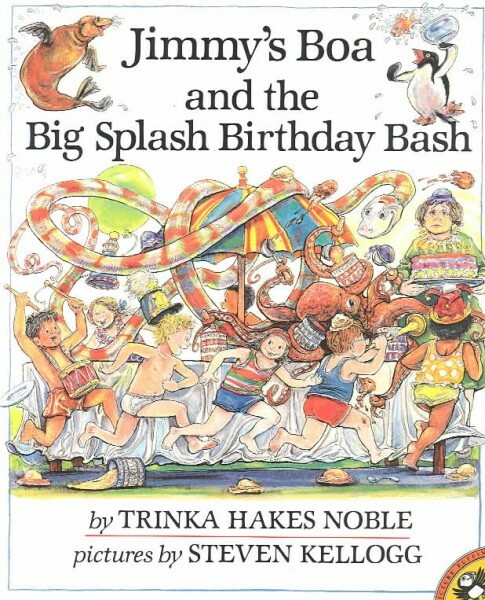 Contributor Bio(s): Trinka Hakes Noble is an award-winning author and illustrator who has published more than 30 children’s books throughout her career. She is best known for the Jimmy’s Boa series, which has been featured on PBS’s Reading Rainbow and translated into seven languages. Noble lives in northern New Jersey. To learn more, visit trinkahakesnoble.com. Steven Kellogg is a beloved author and illustrator who has published more than 100 picture books, including the classics The Mysterious Tadpole, Can I Keep Him?, The Island of the Skog, and Is Your Mama a Llama?, and Pinkerton, Behave!, which was on Horn Book's and Booklist’s Best of the Year lists and led to four sequels. Kellogg is a winner of the Regina Medal for his lifetime contribution to children’s literature. His books have received numerous accolades, such as being named Reading Rainbow featured selections and winning the Boston Globe-Horn Book Award, the Irma Simonton Black Award, the IRA-CBC Children’s Choice Award, and the Parents’ Choice Award. When Jimmy's birthday rolls around, his mom decides to give him a goldfish and a party at SeaLand. Once they arrive, chaos reigns; Jimmy and his guests set off a tidal wave of crazy situations, carefully choreographed in text and art. It's all told by Jimmy's friend Meggie to her mom, who, in the opening spread, demands to know why Meggie has arrived home soaking wet. Their running conversation provides the captions for Kellogg's vibrant illustrations that almost burst off the page with youthful exuberance. The effect is much like a successful real-life birthday party: frenetic for onlookers but fabulous for the celebrators. Ages 4-8. (Sept.) Copyright 1989 Cahners Business Information.